With apologies to loyal Hooptyreaders, I apologize for my extremely sporadic posting on my entertaining internet presence. I am currently in the midst of a supermega giant and secret project that will dwarf all prior tinkerings. As a part of this effort, I have to paint a cabinet over the last couple days and I was reminded of the supreme usefulness of the Purdy Brush Cleaning Comb. The drudgery of cleaning paint brushes is due to the hardened paint that has wicked it's way in to the base of the bristles. This is why used and improperly cleaned brushes are unreasonably stiff and leave nasty streaks. 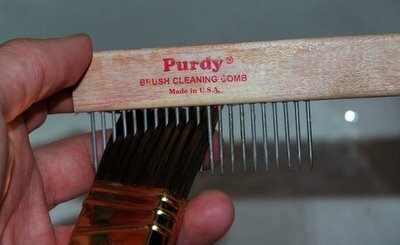 But, with a little hand soap and the uncommonly handy comb, you can really clean a paint brush in just a couple minutes.